Established in 1971, HDC MidAtlantic was founded by a small group of committed community members with a shared vision to provide affordable homes for older adults. The company has grown significantly since then emerging as one of the largest providers of affordable housing in the mid-Atlantic region. 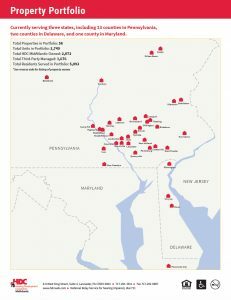 Today, HDC MidAtlantic owns or manages over 3,500 quality affordable rental homes in Pennsylvania, Delaware and Maryland serving 4,700 families, seniors, and our friends and neighbors with disabilities. We will be the premier non-profit provider of affordable housing. Residents, Stewardship, Healthy Communities, Financial Stability, Diversity, Employees, Partnerships. HDC MidAtlantic accomplishes its mission by providing real estate development services, property management services and resident supportive services. With a focus on performance, our mission-minded team of experienced professionals is committed to creating healthy communities for residents through innovation, collaboration and partnership.